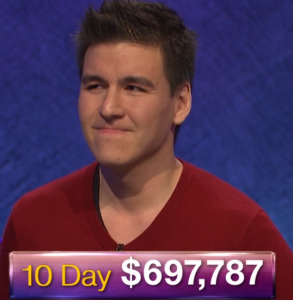 Brandon’s contributing his thoughts on his run in a series of blog posts for The Jeopardy! Fan. Here are his thoughts on yesterday’s game! While more common status codes are 404 Not Found, 403 Forbidden, 401 Unauthorized, and 500 Internal Server Error, 451 is a more recently-approved error status code in the HTTP protocol. A refernce to Ray Bradbury’s Fahrenheit 451, it was standardized in February 2016 to be displayed when a resource on a web page can not be served for legal reasons (like government censorship). You can find more information about it at RFC 7725. 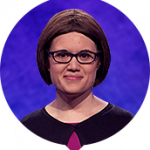 15 Comments on "Today’s Final Jeopardy – June 27, 2017"
An average of 1.524 5+-time champions (standard deviation 0.96185). An average of 2.4304 4+-time champions (standard deviation 1.1631). An early cutoff took place 2.254% of the time (or a 5-game winner will be left out). Brandon Randall qualified 11.202% of the time. Tim Kutz qualified 74.433% of the time. Todd Giese qualified 31.235% of the time. Rob Liguori qualified 5.314% of the time. I hope the ToC airs whether in July or in November. How so? Because you have a reason not to watch it? The last ToC was in November 2015. It’s definitely not airing in July. I’d say there’s a 99.999% chance of it airing in November. It will most likely be in November, Andy. You are right, yes! 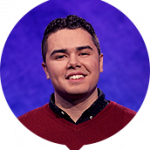 Since Jeopardy canned the Seniors Tournanent, only two “regular” tournaments have been held in July, both Teen and both sporadic (2007 and 2014). They wouldn’t hold a Tournament of Champions in July. Is it too early to speculate on when Season 34 will begin? September 11 happens to be a Monday this year though it didn’t affect Season 23 starting on that date 11 years ago. I’m reasonably certain S34 begins on Sept. 11 — if I’m not mistaken, the first few weeks of Season 34 were taped as a contingency against a lengthy WGA strike possiblity. 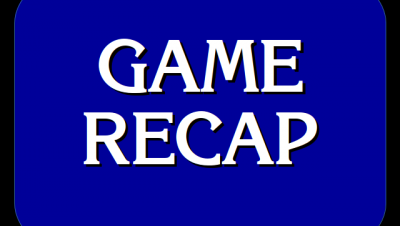 Well my best guess because the last ToC airing in Nov. 2015 and the next one won’t be airing until Nov. 2017 is that because of the Washington D.C. games and tournaments played in 2016. The ToC has aired entirely outside of sweeps only twice – Season 21 (weeks 3 & 4, when it was taped early as a contingency against a WGA strike in 2004) and Season 25 (March 2009, when it was taped at CES in Las Vegas in January 2009). I do recall, perhaps in late April, someone Tweeting that they’d just taped and would be airing on 2017-09-12. Finally, while not a hard and fast rule, it seems reasonable that only the previous season’s special play fills the summer hiatus. With only three standard tournaments in Season 33, that strongly points toward a Sep 11 start for Season 34. The Teen Tournament was originally going to air at the end of season 32 or the start of season 33. Perhaps the NEXT Tournament of Champions got delayed because the College Championship and Teen Tournament was returning after the Sony hack. I think that is one of the best guesses. I think between November 2015 and November 2017 it would be the longest stretch between ToCs, beating out between February 2013 and November 2014.